This classic fight bell rings loud and clear. 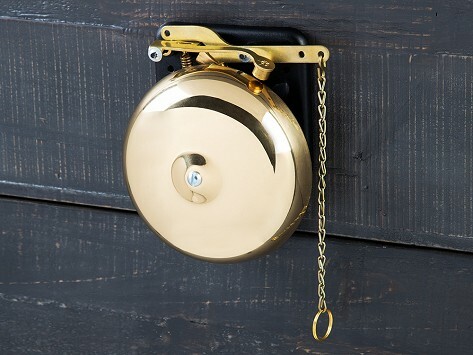 For boxing or wrestling fans or nostalgia lovers, this brass bell is an authentic addition to any space. Personalize one for a truly one-of-a-kind piece. Crafted by renowned bell makers who have been creating their signature brass bells since 1832. Made in the USA and guaranteed to last a lifetime. Dimensions: 7" x 6.5" x 3"
Family-owned Bevin Bells has been crafting brass bells since 1832 in East Hampton, Connecticut, also known as Bell Town. Matt Bevin is the sixth generation of his family to lead the team as they continue to make their signature bells that have been a part of history for close to two centuries. A Bevin bell has both witnessed and played an active role in many memorable moments throughout the last 186 years. The first bicycle bell was made by Bevin Bells, as well as most of the bells the Salvation Army rings each holiday season. And when an angel gets its wings in the movie "It’s a Wonderful Life"? That one is the work of Bevin Bells, too. These traditional bells can bring meaning to your home. One adds classic (and authentic) charm, whether it’s hung from the front porch or out on the patio—or if you want to make your space ring with the sound of a prize fight starting. It’s like having your own piece of history that is also Made for a Lifetime for future generations to enjoy.